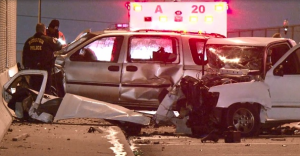 A red light runner caused a major collision last night at the intersection of Hempstead Highway and 43rd Street, injuring two people. Police said one vehicle with a male driver was heading northbound on Hempstead Highway when the driver disregarded a red light at 43rd Street, striking the side of a minivan. The collision was severe enough to flip the minivan over and through it into a ditch, trapping the driver. Fire fighters cut the roof off the minivan to free the lady driver. Both drivers were transported to the hospital and are expected to survive their injures. 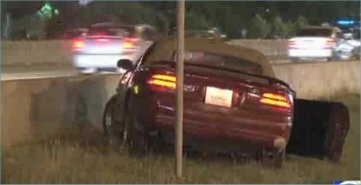 Around 9:00 p.m. Sunday January 12th a motorcycle rear-ended a minivan on Interstate 45 at Edgebrook in southeast Houston. A woman riding on the back of the motorcycle was killed in the crash. Channel 2’s report is here. Houston Chronicle story here. The Chronicle’s article identifies the motorcycle as a Harley Davidson, and states that the minivan changed lanes to enter the freeway when the motorcycle, reportedly traveling at a high rate of speed, struck the rear of the van. Neither the motorcycle driver nor the passenger were wearing crash helmets. The police investigation into the cause of the accident is ongoing. Information on representation for motorcycle accidents in Houston; representation for rear-end collision accidents in Houston. Police say a minivan driver caused a 3 vehicle accident on Harwin near Beltway 8 when he ran a red light. 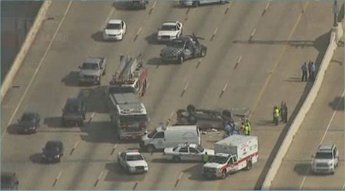 Police say the minivan hit an SUV, causing the SUV to roll over and land on top of a car carrying on off duty Houston police officer. According to Channel 13’s story, two people were treated for minor injuries at the scene and the police officer wasn’t hurt. Hopefully the driver of the minivan has plenty of insurance, it sounds like this accident totaled a couple of vehicles, or at least caused them major damage. 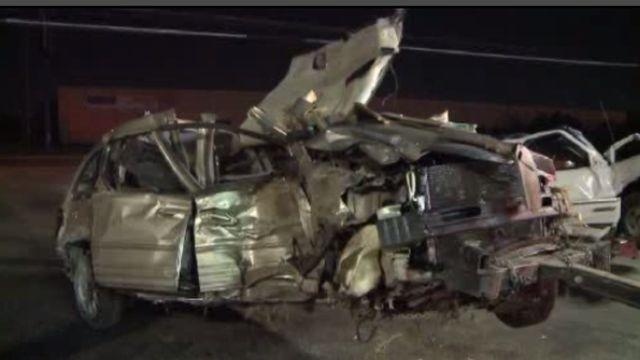 Police believe the driver of a red Ford Mustang who fled the scene of a two car accident last night may have run because he was driving under the influence. Drivers were slowing down along the freeway at W. Dyna to look at a low-rider car showing going on in the parking lot of a shopping center. 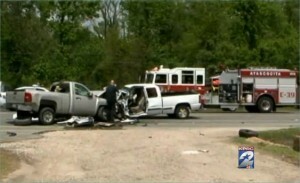 A gold-colored GMC Safari minivan had slowed down on the feeder when it was rear-ended by the northbound Mustang. That impact pushed the minivan into an electrical pole, snapping it, and then into a water pipe that was also broken in the accident. 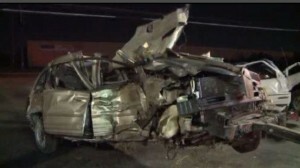 Channel 13’s report said the driver of the minivan was injured in the accident but nobody else was hurt. Police believe the Mustang driver was drunk: officers at the scene said there were beer bottles in the Mustang. Memorial Day weekend is a no-refusal weekend, meaning whether they want to or not, drivers suspected of driving under the influence will be required to undergo alcohol testing. Injured by a drunk driver and not sure what to do? Smith & Hassler’s experienced personal injury attorneys can help. Call for a no cost case evaluation. 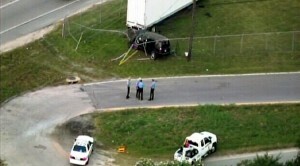 Police are investigating the cause of a fatal accident the morning of Thursday May 24th at around 6:00am. According to FOX News’ report, the accident happened on the 610 Loop South feeder near Calais Road. It appears a black minivan crashed into a stationary big rig trailer that was being used in an advertising campaign. An elderly woman died after a crash between a United States Postal Service 18-wheeler and a minivan the afternoon of Friday May 11th. 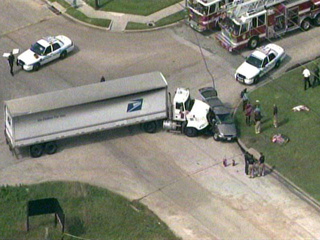 The accident happened at around 3:45 p.m. at the intersection of Misty Willow and Willowplace Court in Northwest Houston. Two people were pinned inside the minivan after the accident and were freed by rescue crews. An elderly woman who was an occupant of the minivan later died at Methodist Willowbrook Hospital. FOX News’ story is here.